The kids are out of school – and that means they’ll be looking for stuff to do! Fortunately, there are tons of great activities, Easter events and drop-in programs all over the city (and beyond) to keep the little ones entertained! For more events, check out our calendar. It’s easy to join in the fun; retailers will hide plastic Easter eggs either in their stores or throughout the common areas of the shopping centre for shoppers to find. For all clues on your hunt, follow our Twitter and Instagram accounts on where the eggs are stashed. Clues will be sent out throughout the day, so make sure to check back! Inside each colourful egg you will find a prize voucher for exciting retailer prizes such as gift cards, swag, gift baskets and more that can be claimed either at the participating retailer’s cash register or Guest Services (located on level 3). Website. We’ll start off in the Birthday Barn listening to the Legend of the Easter Bunny! Once we hear what the Easter Bunny needs each of the children to do (he really appreciates their help! ), then it’s off with our baskets to do his bidding with a special hunt. When the children find the items the Easter Bunny needs, they’ll carry them over in their baskets and send them down the tunnels to help the Easter Bunny get everything sorted to go to his Secret Workshop where they magically turn into Easter Eggs for all the girls and boys in the world. All the ‘kids’ then head in to the Prairie Palace to get their own spring planting underway with an Easter pot to take home, all planted, watered, and put into a plastic bag. Dress warm! Register ahead; this event is popular! Website. Get a free photo with the Easter Bunny and complete fun Easter crafts! On March 31st at 2pm, come and participate in an Easter Egg Hunt! (registration required, starts at 1:30pm!) Website. Peppa Pig & her brother George are coming to Northland and want to meet you! Head to Centre Court to meet your favourite sibling duo. We’ll also have face painting, a balloon artist, colouring pages and more! The event is free, but we encourage you to bring a non-perishable food item for donation to The Calgary Food Bank. Website. This free class teaches children about the Engineering Design Process and mechanical engineering. Build, test, modify and re-test a drawing machine made with LEGO® bricks. Discover how simple machines including gears, wheels and axles, and levers are useful design tools for mechanical engineers. Limited Spaces. Registration is required. Taught by Mad Science of Southern Alberta. Brought to you by The Calgary Public Library. Website. A “must-see” multiple award winner and acclaimed family entertainer! Fred Penner is an icon of Canadian culture. For more information and to purchase tickets, visit the website. Go out and spend a fun off-the-grid evening with lots of other Calgarians! This fun and free evening will feature free hot chocolate, bike-powered music and lights, kids’ nature games, and lots more! Event-goers can bring a light, drum, costume, lantern or decorate their bike and take part in a procession to signal the beginning of Earth Hour. Website. Do Something Memorable for Earth Hour! Join the Glenbow Ranch Park Foundation and the Royal Astronomical Society of Canada Calgary Centre for a night of star and planet gazing! Telescopes will be provided for participants’ use, and there is a chance that one or two of Jupiter’s moons will be visible. As this is an outdoor event, don’t forget to layer and dress warmly! Accompanied kids are welcome. For more information, visit the website. There are two activity times: 9:30 to 11:30am & 6:30 to 8:30pm. 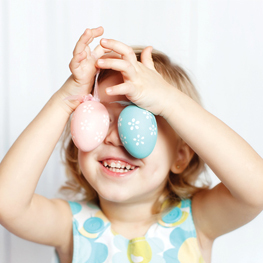 Hope on down and make Easter crafts for your family and friends, and enjoy some light refreshments, too! For all ages plus an adult. Website. In partnership with Calgary’s Child Magazine. Enjoy two days of classic springtime fun at the Calgary Zoo. This year, the Zoo decided to spring into action for wildlife conservation! Kids of all ages will love the fun-filled family activities including face painting, sweet treats, bunny races, cookie decorating and more. All activities are free with regular admission. For more details on the egg-stra special family-friendly holiday event, visit the website. Join in the fun and have your pooch sniff for dog treat filled eggs across Calaway Park’s south lawn at the 7th annual Easter Egg Hunt for Dogs in support of National Service Dogs on Good Friday, March 30. National Service Dogs is a non-profit, registered charity dedicated to enriching the quality of life and enhancing the independence of children and families living with autism and special needs. Website. Put a little spring in your step and join in the Easter festivities at the Calgary Farmers’ Market! Hop on over to the main stage and get your picture taken with the Easter Bunny and decorate an Easter cookie too (while supplies last). Cash or food donations for the Calgary Food Bank will be accepted to snap a bunny photo and to ensure no one goes hungry this Easter. Website. Come on down to Westbrook Mall and enjoy some Easter fun! Have your picture taken with the Easter Bunny and enjoy our petting zoo! Website. Cineplex’s Family Favourites is a great way to enjoy a classic family movie at a great price! Admission is $2.99 per person, making this a great way to spend the weekend with the family crew. Participating Cineplex Theatres are Crowfoot Crossing, Sunridge, Chinook, and CrossIron Mills. Website. Learn more about Jamaican culture at this year’s Taste of Jamaica! Enjoy a tasty serving of authentic Jamaican fare: think ackee and saltfish, fried plantains, jerk chicken and fried dumplings – included with the adult admission price. And check out live performances featuring reggae and gospel music and a children’s area with face painting and games. Adults $15; children $5; families $35. For more information, visit the website. Hippity Hoppity, the Easter Bunny is on its way! Stop by Marlborough Mall and get a free 5 x 7 picture with the Easter Bunny. While you are there, participate in the Easter Egg Hunt, and don’t forget to stop by and visit all those cute barnyard animals at the Butterfield Acres Easter Petting Zoo! Website. The Olate Dogs are the winning participants from Season 7 of America’s Got Talent! Led by Richard Olate and his son Nicholas, the Olate Dogs are a high-energy, fast-paced canine theatrical act filled with amazing dog tricks, human acrobatics and humour. Website. The mission of this festival is to encourage all recognized multicultural associations representing their country to participate in the event through songs, dances, performances and activities! Bring the family. Website. This entry was posted in Uncategorized on March 15, 2018 by Calgary's Child. It goes without saying that we want the best for our kids! As parents and caregivers, we try to do our best to navigate the messages, images, pressures, and expectations that come along with caring for a child, but it is not an easy task. As a long-time recreation professional and parent of a 19-year-old, I know how hard parenting is, and I am lucky enough to have help along the way! These days, one of the messages we often hear is our kids are more sedentary than ever before. What does that mean? Well, can you believe that only 9 per cent of Canadian kids between the ages of 5 to 17 get the recommended 60 minutes of heart-pumping activity recommended each day? Think about that: only 9 per cent. That means that in a group of 10 children, only 1 child is getting enough physical activity each day! Recently, ParticipACTION came out with the “Canadian 24-Hour Movement Guidelines for the Early Years (0 to 4 Years)” and split them into three important categories: Moving, Sleeping, and Sitting. What if we all started thinking about our days using these three categories? As parents and caregivers, we know that little ones need their sleep, and, let’s face it, so do parents! However, the amount of time spent moving versus sitting is a critical factor in growth and development. All people, of any age, cannot function properly without the right combination of sleeping, moving around, and sitting. It’s critical for us to be mindful of how much time is spent on each of these categories daily, and to teach our children healthy habits early on in life. 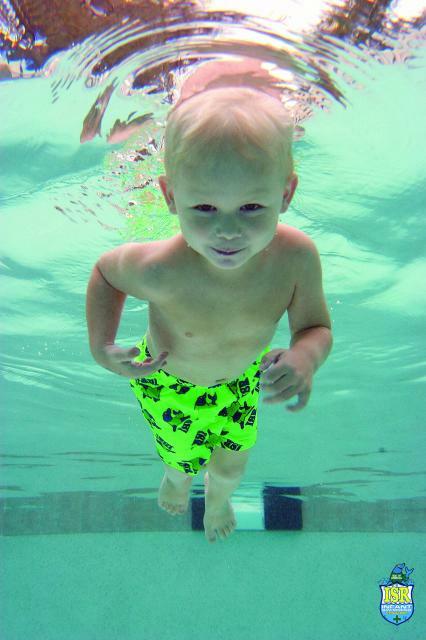 Although it can seem challenging, breaking up your child’s day to include more movement and active play is easy! Think about getting outside to your local playground or park, play or create movement-based activities at home, or access the many low cost and/or free activities throughout Calgary, many of which are listed in Calgary’s Child Magazine! 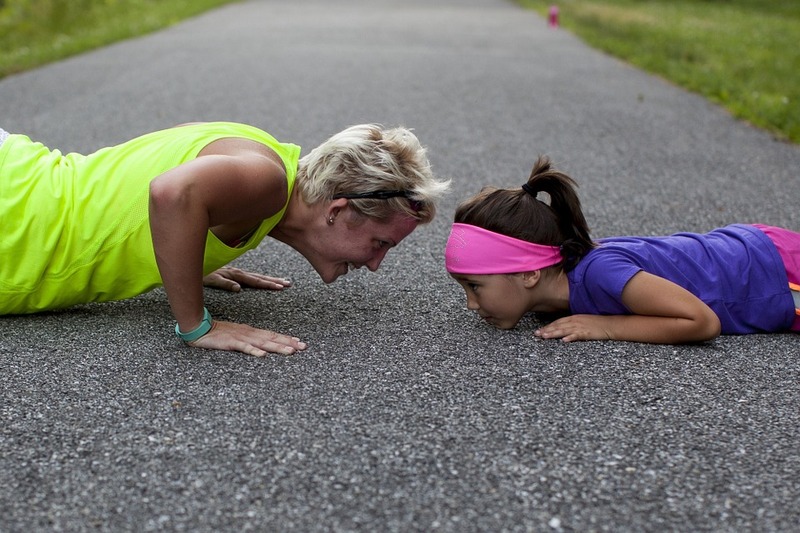 We all want the best for our kids, so let’s get them started on the right foot! 12 to 16 hours for 4 to 11 month olds of good quality sleep including naps. Not being restrained for more than 1 hour at a time (e.g., in a stroller or high chair). Screen time is not recommended. When sedentary, engaging in pursuits such as reading and storytelling with a caregiver is encouraged. At least 180 minutes spent in a variety of physical activities at any intensity, including energetic play, spread throughout the day – more is better! 11 to 14 hours of good quality sleep, including naps, with consistent bedtimes and wake-up times. 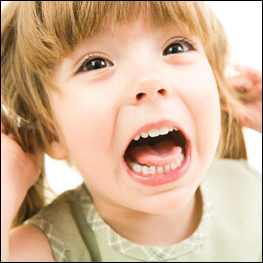 Not being restrained for more than 1 hour at a time (e.g., in a stroller or high chair) or sitting for extended periods. For those younger than 2 years, sedentary screen time is not recommended. For those aged 2 years, sedentary screen time should be no more than 1 hour – less is better. At least 180 minutes spent in a variety of physical activities at any intensity, including energetic play, spread throughout the day – more is better! 10 to 13 hours of good-quality sleep, including naps, with consistent bedtimes and wake-up times. Not being restrained for more than 1 hour at a time (e.g., in a stroller or car seat) or sitting for extended periods. Sedentary screen time should be no more than 1 hour less is better. Heather proudly works for The City of Calgary Recreation Department and believes that together, we can impact activity levels of kids in this country. This entry was posted in Uncategorized on March 9, 2018 by Calgary's Child. Pack your bags – we’re off to the airport! Believe it or not, the Calgary airport is a pretty incredible destination all on its own. Lots of us have kids who are airplane super fans, but it’s hard to find an opportunity to really let them explore that interest. We have an idea for a special escape they’ll never forget. 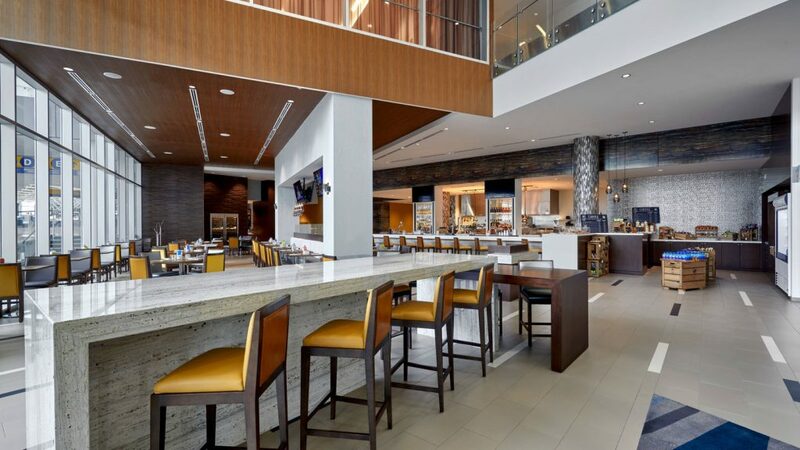 The Calgary Airport Marriott In-Terminal Hotel is a unique, boutique-style hotel which has recently opened adjacent to the new international terminal at the Calgary Airport. Full disclosure: Marriott invited us to stay with them for a weekend to sample all of the incredible services it has to offer. This Marriott is fully-equipped for an inclusive family experience; their indoor pool has a lift for guests with mobility challenges, there’s valet parking, and large family suites are available with a toy box, a king and sofa bed, and two bathrooms. 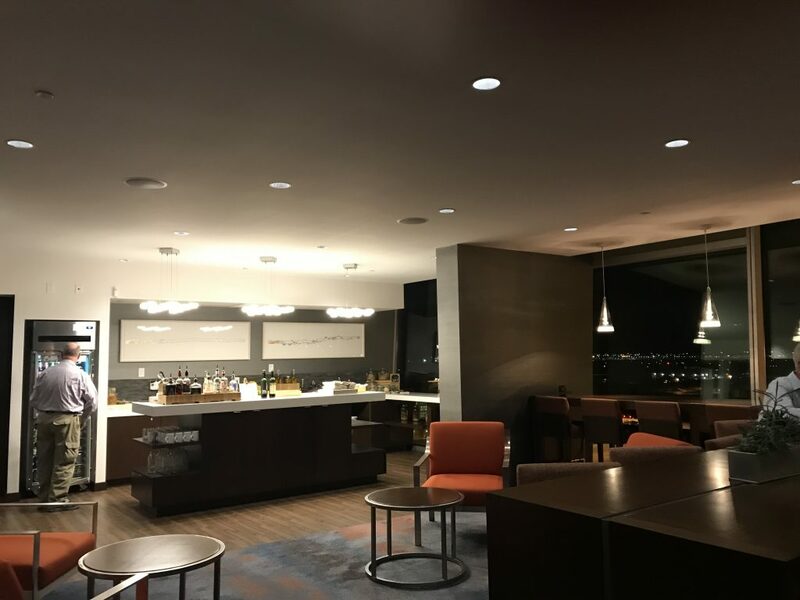 The M Club Lounge on the 7th floor overlooks the terminal and serves free breakfast, evening service with complimentary hors d’oeuvres and 24-hour snacks and drinks – a lifesaver for kids with unusual sleep cycles. The modern, well-appointed rooms have sound-proofed floor to ceiling windows that offer a birds-eye view of the airport’s active arrival and departure gates. 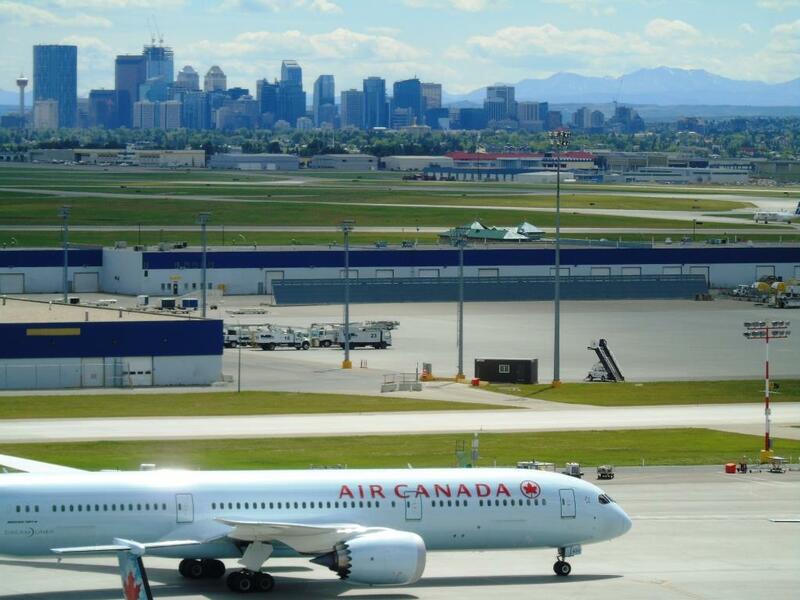 A free, downloadable YYC app will actually tell you where each plane is going or coming from as they take off and land. Rooms are also equipped with telescopes to get a close-up view of the planes. We were pleased to note that the hotel is also very dog-friendly, which is a huge advantage for families needing the assistance of a service or companion animal. If your ultimate destination is somewhere away from Calgary, the ability to have a good night’s sleep and avoid the struggle of a 4am drive on winter roads was very appealing. A restful night in a hotel next to the airport gives plenty of time to adjust your child to the idea of air travel, as well as allowing hours and hours of exploration of the terminal, shops and play places at the airport without the fear of missing important check-in times. An often-missed but really incredible destination at the airport is SpacePort, a unique space and aeronautics facility with hands-on exhibits and displays – it’s almost impossible to find time to visit when you’re rushing around the airport to catch a plane, but having an extra evening makes all the difference. 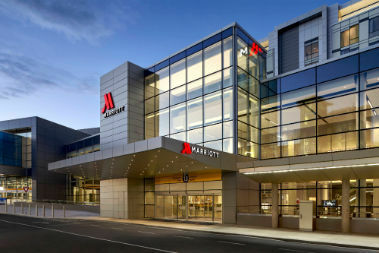 If you have family coming into town, the Calgary Marriott In-Terminal Hotel provides an incredible array of services for adult travelers. The staff at the hotel are proud of their ability to create and customize exclusive experiences for their guests (you wouldn’t think of having a conference, milestone birthday or a wedding at an airport hotel, but trust me when I say their event services are incredible!) The Yakima Social Kitchen + Bar aims for world-class dining and hospitality, and their unique, locally-sourced menu certainly ranks it alongside the very best of what Calgary’s dining scene has to offer. 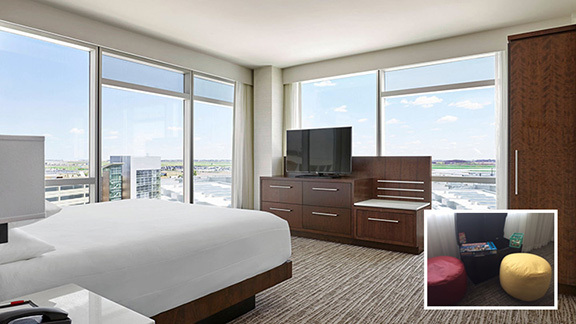 Whether you’re looking to ease the transition into a family vacation, hoping for a romantic night away (but not too far from the kids), need a place for family to stay when they come visit or are looking for your next business conference venue, the Calgary Marriott In-Terminal Hotel is a great option for lots of different needs. They work hard to accommodate the unique needs of their guests and are happy to work with you to ensure your family has a great time, whatever your reasons for staying. Bon voyage! This entry was posted in Uncategorized on February 8, 2018 by Calgary's Child. Emergency vehicles might use any available road space to maneuver. This could include the shoulders, turning lanes, in order to pass other traffic. Always leave plenty of space between your vehicle and an emergency vehicle, should it be required to stop suddenly. This entry was posted in Uncategorized on December 27, 2017 by Calgary's Child. the mix and you’ve got the potential for one huge headache. With a little patience (and planning ahead) shopping for the holidays can be a little less frenzied. Make a shopping list, plan your budget and set an itinerary of which stores you want to visit before you go – and stick to it! child’s best part of the day. You’ll find the mall less crowded if you shop during the non-peak hours which are earlier or later in the day – if your child is an early bird or a night owl, use this to your advantage. Be sure to go over expectations of behavior before you leave and reinforce that this trip is about picking up presents for others, not for buying things for ourselves. Involve your kids and let them help plan part of the shopping trip. Would they like to stop in a favorite store or stop at a play place? Set a time limit. Letting them shop for a special gift for a family member will help them feel involved. The dollar store works well for this. Don’t forget to plan regular breaks during the shopping trip, pack along a special snack or make a plan to stop for lunch. 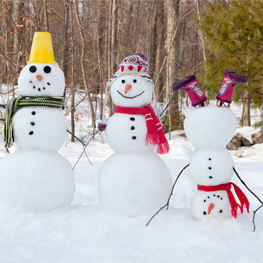 Try to make the trip enjoyable – after all, this is what the holiday season is really all about! Visit Santa and enjoy all the special Christmas activities throughout the mall you are shopping at. Recruit help. If your spouse or a friend is available, you’ll find it easier to “divide and conquer” or keep your kids on track with help. If you know bringing your child shopping is a bad idea, consider securing babysitting for an hour or two. Stock up on gift cards for those hard-to-buy-for people in your life! You don’t have to get the world’s most creative and thoughtful gift every year and often it’s the thought that counts. Have your gifts wrapped for you – many malls offer this service, some with proceeds going to a charitable cause. Consider shopping online! You may pay extra for rush shipping, but sometimes it’s worth it to avoid repeat visits to the mall through December! help you all get through the outing a little less frenzied. Ellen is the publisher of Calgary’s Child Magazine. This entry was posted in Uncategorized on December 11, 2017 by Calgary's Child. the toboggan hill by following these simple reminders. Children should wear a properly fitted helmet designed for other high impact sports such as hockey, cycling, or climbing. Beware of loose scarves or clothing containing drawstrings which can present a choking hazard if they become caught, or snagged. If frost bite has occurred, treat it by first removing the individual out of the cold environment; Gently warm the affected skin by placing a warm hand over it, or by placing the affected part in warm, not hot, water, until re- warmed. This entry was posted in Uncategorized on November 22, 2017 by Calgary's Child.